The crisp bold lines of stencils combined with thinner more delicate sgraffito designs can result in a beautiful contrast on pottery. Case in point, the work of Anna and Kevin Ramsay. 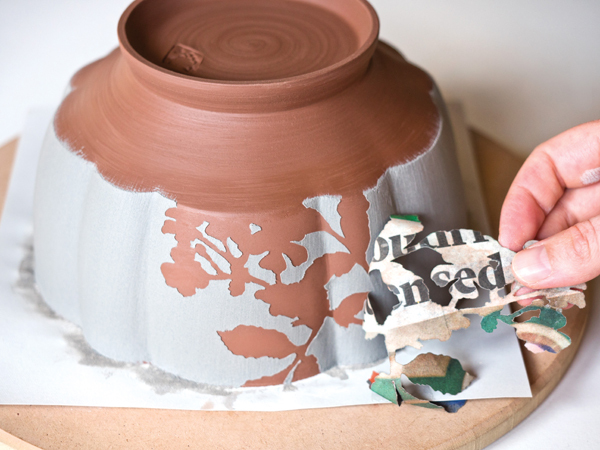 In this post, an excerpt from the Ceramics Monthly archives, Anna and Kevin share their unique way of creating stencils, as well as a cool image transfer process that aids their sgraffito technique. – Jennifer Poellot Harnetty, editor. Our life and values are strongly rooted in self-reliance, so when Kevin and I began working in clay we resisted investing in studio equipment. Instead, we invested time and spent a year and a half developing a clay body, slips, and glazes that would later form the foundation of our work. Looking to focus on creating highly functional tableware, finding a dense, non-porous clay body was a priority. Low-fire ceramics appealed to us from an economic perspective but unfortunately didn’t offer the physical properties we desired. This prompted research into fritware and its ability to achieve high vitrification at low temperatures. Discovering Abu’l-Qasim’s 13th-century treatise on ceramics formed a base to start experimenting with formulas. No matter how great a glaze is, the dip-and-done approach to glazing can get old. Sometimes you want something with a little more depth. If you’ve been feeling less-than-thrilled with dipping your pots into the same old glazes, you’re in luck because Colleen Riley is here to help you add some new life to your surfaces! In her video, Colleen shares numerous techniques for creating spectacular surfaces through layered imagery. Although fritware was traditionally made using a white clay body, we opted for a red body that, when combined with white slip resist and sgraffito, would result in a rich, multi-layered surface. While designing our surface patterns, we were thinking about how slip resist could be used to suggest layers in an illustrated narrative. The graphic contrast of the silhouettes creates an interesting surface that can be seen from a distance, while the intricate sgraffito lines must be explored up close. The composition of elements is approached intuitively for each piece at the time of application. This creates a constantly changing and evolving surface, which is rewarding both in practice and result. 1 Cutting paper resist illustrations with a jeweler’s saw. 2 Brushing white decorating slip over the paper resists. To create our paper resists, we sandwich and staple approximately 24 pieces of newsprint between card stock and stack cut them using a jeweler’s saw (1). Once the bowl is leather hard, the paper resists are dipped in water and gently applied to the surface using a moist sponge to smooth over any wrinkles. White decorating slip is then brushed over the entire surface (2). Once the wet sheen has disappeared from the slip, the resists are removed (3). Paying close attention to composition while applying the resists, our goal is to create interesting negative space or movement over the surface. Keeping the bowl turned upside down supports the rim and prevents distortion while being re-wet and handled. 4 Punching holes through tracing paper to create an image transfer. The piece is set aside to dry until it has reached a point where, when sgraffito lines are carved into the clay, the burrs curl and fall away on their own. Carving when the piece is still too wet will result in lines that are deep with edges that flare and are difficult to clean. Alternately, waiting too long and dry carving results in a poor, chattered line quality. To help compose the sgraffito illustrations on our surfaces we create pierced image transfers out of tracing paper (4). This is especially useful with the bowls as it can be a challenge to visualize and plan a narrative upside down. Placing the transfer gently against the surface of the bowl, we pounce powdered graphite over the image transfer (5). 5 Pouncing powdered graphite through an image transfer. 6 Carving through the white slip using the graphite transfer as a guide to create a sgraffito pattern. The graphite dots left behind create a guide to follow while carving (6). The tool we use most often for sgraffito is a dental pick that has been straightened into a stylus. Once the bowl is bone dry, the burrs of clay left from the sgraffito are removed and the rims are gently sanded to round any sharp edges. bone dry, clay, leather hard, low fire, paper resist, resist, set, sgraffito, slip, slip resist, wax resist. I’m wondering why you cut the stencil with 24 layers ? It doesn’t seem like you use them all unless you’re making multiple pots. I’m curious. how did you get the turquoise to resist the clay body in the final image? The white area ended up turquoise and the clay body a fade. How was that accomplished? Did you have to hand paint a resist when dipping the glaze? Seems redundant if so. I would like to try this though. Thank you!